A phone for elderly hackers? I've been looking with envy on all people around with flashy smart phones. All these iPhones and Androids. My problem has been: Should I aquire a phone capable of computing or a computer capable of phoning. I'm an open source - open access kind of person. I just cannot buy any i* gadget. Apple's business model is clever, but I need a device I can understand. I've been UNIX man for more than twenty years and to buy something without a shell would be unthinkable. On the other hand I'm using my computer for the same reasons as every one else. I.e., mostly surfing and communication. Which would be the same as a mobile internet device (a MID). 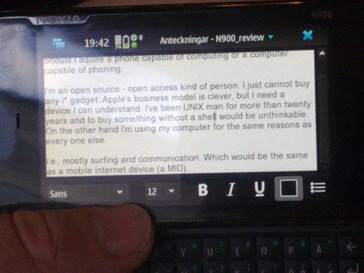 In spite of the fact that I had settled that my next phone should be an Android one, the fate wanted that I should run into Nokia N900. This gadget weighs more than twice as much as an iPhone but you i think you should compare it with an iPad rather than with a cell phone. It is actually easier to send an email than to make phone call. Nokia doesn't market the thing as a phone but as very mobile computer. Yes, I do know that iPad has a screen which is (perhaps) six times as large as the one on N900. But I have checked out my entire web site from my CVS repository and I'm able to run the entire rebuild machinery. This is a computer that allows creativity. I did try to install emacs and nxml mode but that wasn't trivial. The OS is called Maemo, which is a Debian based Linux maintained by a community sponsored by Nokia. The development is promising since Nokia and Intel are joining forces and are merging forces. Their respective mobile OSes will merge into Meego maintained by Linux foundation. A phone for an old nerd? 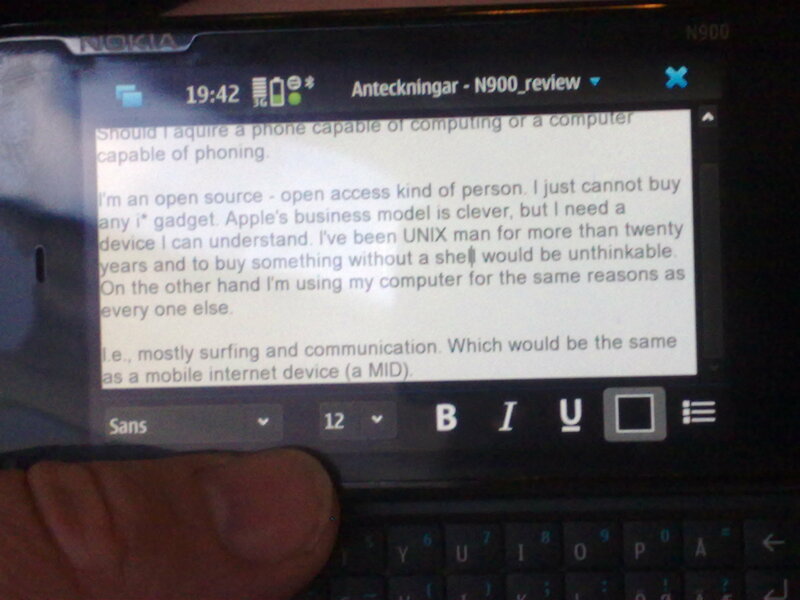 The N900 is about as large as a state of the art smart phone, a bit larger when the keyboard is slid open. It is twice a thick as an iPhone, and when carried in your pocket it will bulge. Well. This is a very good little tablet computer. ... just works. Sometimes things aren't really as intuitive as you wanted. Or, perhaps, the intuition of the designers were not the one you expected but that is common, isn't it? There's a lot of other software. OpenOffice.org is here and then there is the whole lot of UNIX utilities. I can plot my data using Gnuplot and edit perl script with VI. So what about the screen and keyboard? The buttons on this thing are smaller than on my phone. You operate with your thumbs, and it does work. The suite supplied by Nokia uses some clever T9 like algorithm for guessing what you're typing which minimises the typing. The thing will keep you connected 24/7. The thing has 3D graphics, and should you like a shoot'em: DOOM is ported! This entry (A phone for elderly hackers?) within Sigfrid Lundberg's Stuff, by Sigfrid Lundberg is licensed under a Creative Commons Attribution-ShareAlike 3.0 Unported License.